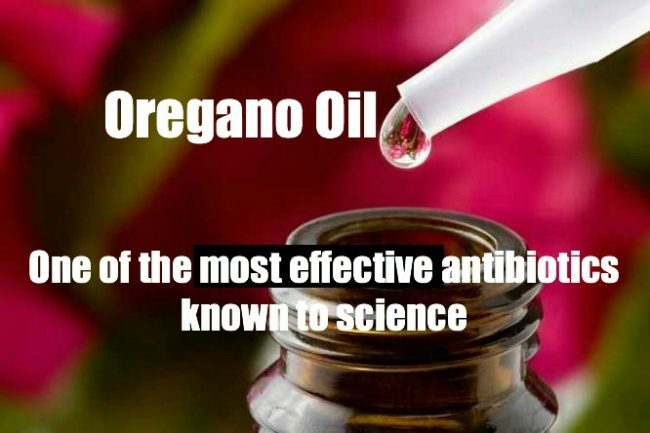 Oregano is a potent herb with a myriad of health benefits, and oregano oil is the ultimate natural antibiotic known to science. “Botanically known as Origanum vulgare, oregano is a flowering plant from the same family as mint. It is often used as an herb to flavor food. Although it is native to Europe, it now grows all over the world. This herb contains three times more antioxidants than blueberries, and the oil is the richest source of carvacrol. It has been found to kill various strains of bacteria, by destroying their cell membranes and inhibiting their replication. What’s more, it destroys the harmful bacteria only, leaving the beneficial probiotic bacteria intact, unlike pharmaceutical antibiotics, which destroy our gut, and cause various side-effects. Oregano essential oil is a rich source of minerals, like iron, copper, manganese, calcium, magnesium, zinc, vitamins C, A (beta-carotene), Niacin, potassium, and boron. It contains four main groups of chemicals which are active healing agents and act as antioxidants and antiseptics. Carvacrol — Research has shown that this phenol has promising potent healing properties and can fight several types of bacterial infections such as E. coli, Candida albicans, salmonella, listeria, staphylococcus and more. Thymol — Another phenol, this compound has excellent antiseptic properties and is great for treating fungal infections. It also helps protect against toxins and promotes healing. Rosmarinic acid — Powerful antioxidant and antihistamine, naturally reduces swelling and is effective in treating allergic reactions. Terpenes — Brimming with potent anti-bacterial properties. Linalool — Soothes and relieves stress and anxiety. Naringin — Restrains cancer cells from growing and supports the other antioxidants in oregano oil. While Linalool and borneol are two long-chain alcohols concentrated with strong antiviral and antiseptic properties, esters like linalyl acetate and geranyl acetate offer potent antifungal properties. When purchasing oregano essential oil, make sure it is 100% pure, raw, unprocessed, additive-free, steam distilled, and aim at the highest carvacrol percentage you can find, which can vary from 50% to 85%. Note that even though it is completely natural, you should use it for a short time as it is still an antibiotic. You should take it orally for 7-10 days at a time. Before use, pour a drop of it on the arm and see if it causes any reaction. Remember to always dilute it with a “carrier oil” such as coconut or olive oil.